A Visit from Kira! All the way from Oregon! Kira came all the way from Portland which is far away. If you check back you can see that she was my first visitor as I moved in to assume full Huskercat responsibilities. On a sad note, she was also Tommy's last visitor just a few weeks before he ... um ... passed on. 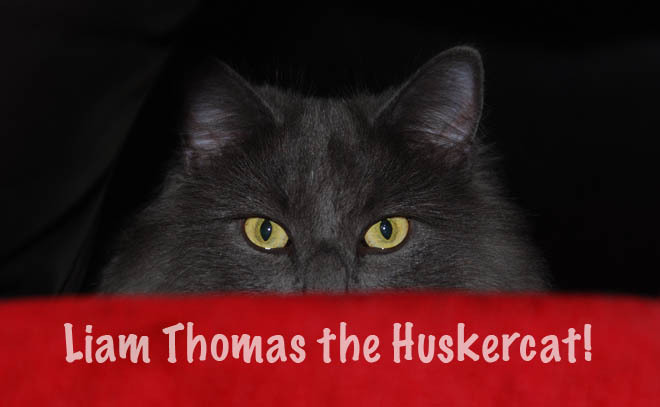 Tommy was the original Huskercat, but now everyone will just have to get used to me. I didn't have a choice so everyone just needs to deal with it! Naturally I have to include this picture of her in her Huskershirt. Upon close inspection you might notice that Kira has black hair in one picture and blonde hair in the other. Cats have extremely good eyes so I thought I should point this out. That struck me as unusual. I've only been the cat-in-residence for a couple months and I can say that some mighty peculiar things happen around here. For example, when I left the humane society I had not considered that I would be expected to write a blog! I'm not complaining, I'm just saying it's probably useful to stay alert around here! Kira said she'll be back in a couple months so obviously I'm a hit with her. That's pretty cool!